At War with Cystic Fibrosis: An eventful six months! Sorry that I haven't updated this blog in ages! A lot has happened in the past 6 months...there has been a lot of ups and downs and I've been very busy! At the moment, I am in Bristol Children's Hospital again - I have been here since the 29th of June, the day after my birthday! So, I'm going to update you on what has been happening since I last updated my blog! In May, I went into my local hospital for an admission, to start NG tube feeding again as my weight had gone down. The admission turned out to be longer than planned, as my CRPs - infection markers - had risen (but only to 16). Because of this, I could not go to the McBusted concert in Birmingham! I was gutted. But the kind nurses and doctors all put some money together (100 pounds in total!) for me to treat myself with! I had a horrible stay in hospital because I was forced to have some really unfair conversations. After the admission, I was looking forward to going to see One Direction in concert in Sunderland, however the consultant in Exeter would not give us a 'Fit to Fly' letter, so I unfortunately had to miss out on that concert too...:-(! I did get the chance to see One Direction in Wembley Stadium though! I loved the concert, the boys were amazing! I was still feeling very nauseous though, and near the end of the concert, I was sick and we had to leave early. We broke up the journey to London by stopping by at Cardiff on the way there. I was meant to go to a Little Mix concert there, but I was very tired, and had to give the tickets away. On the way back from Wembley, we stopped over at Bristol. A few days after getting back home, I had to go back into hospital because my CRPs were up yet again. The day after being admitted I got a very bad gastric bug, which turned out to be the rotavirus. My albumin (blood protein) level, which had previously been normal, dropped into the low twenties (normal is between 35 and 50). Because of this, the worry was that fluid might begin to accumulate around my lungs (pulmonary odema). My albumin reached as low as 20, and the doctors said that if dropped any lower they would use a human albumin infusion to bring the levels up for the short term. I was put on Optiflow (like Vapotherm) to ease my breathlessness and in an attempt to "wash out" some of the excess carbon dioxide in my bloodstream. During the following two weeks, I had agonising pain in my abdomen and back. I was put on stronger and stronger pain killers to help my pain. Eventually, I was on lidocaine patches, paracetamol, oral morphine and tramadol, but nothing seemed to even touch the pain I was in. I spent my birthday in hospital and the pain was worse than ever. I didn't have a very good birthday, but I got some lovely presents - my parents and sister got me an iPhone 5s! The nurses got me two big cakes - a strawberry cheesecake and a chocolate cake - but I felt too sick to even try any of it! Throughout this time my local consultant was trying every day to get an urgent inpatient transfer to the regional tertiary centre where the specialist gastric team are based. While I was waiting I had x-rays ultrasound scans and an MRI scan, and had daily visits from the pain nurse and anaesthetists in an attempt to find something that would reduce the pain. I also saw the Orthopaedic consultant, who confirmed that pain was "nothing to do with muscle or bone" and was therefore likely to be solely a gut issue. It had previously been asserted by both local respiratory consultants and a transplant consultant from London that my abdominal and back pain was largely contributed to by postural issues, which I always felt was wrong, so it was good to get this opinion from a specialist orthopaedic consultant. On Sunday 29th of June I finally got a bed at, and transfer to, the tertiary hospital in Bristol. The two hour ambulance transfer was horrible, and I didn't have the best of starts on the ward, but one thing that gave me some instant relief from some of the pain was that they switched the tramadol from oral to intravenous. I was suddenly needing more oxygen and my breathlessness was worse. The following evening we found out that my potassium level was 2.7 and my albumin level had dropped suddenly and drastically to 15. I continued to feel worse with my chest over the next few days, and on the 3rd of July, in the evening, I started coughing up substantial amounts of fresh blood. The respiratory consultant on call came to see me and outreach nurses from HDU and ITU also visited. The ITU consultant in charge was also alerted. Thank God, after a couple of hours the blood had reduced a lot and eventually stopped coming up completely. The following day, Mom and Dad suggested using a few different antibiotics that Mom had been reading some research papers on, and that they thought were worth trying. One of the antibiotics is an antifungal, which has been shown in research studies to work synergistically with an oral antifungal that I've been on long term. Mom and Dad had been asking our local respiratory consultants for some time to try this combination, to try to eradicate the Exophiala. Thankfully, the consultant at the tertiary centre went for it, because I felt some big improvements. My breathlessness got much better, and my oxygen requirement went back down. The results from my blood tests started showing some good trends too. The most exciting one was the Beta D-Glucan, which is a marker of the presence of fungal pathogens in the body. In me this had been extremely high, at over 500 for more than a year. At it’s lowest in mid July it was 66. This was amazing news for me because anything below 80 is considered normal levels! My CRPs had also come right down to 4. Back to my gut issues...during the first two weeks in Bristol I had loads more tests and scans, including a capsule endoscopy. I had to swallow a capsule containing a camera, which then transmitted images to a recorder which was attached to a belt around my waist. This gave detailed visual information on every part of my digestive tract...nice! ;-) I could see inside my body with an iPad app! It was very weird! I was put on on an "exclusive" diet on July 12th, which basically meant that I had to exclude all food other than the broken down liquid feed which goes through my NG tube...I couldn't even drink orange juice, and I've drunk tonnes of orange juice every day for longer than I can remember! This diet wasn't fun, but I started to see some small steady improvements each day; my potassium levels seemed to be stabilising and my albumin and total protein levels were slowly rising (with albumin reaching 20 at one point), some of my other nutritional markers started creeping up too. The really frustrating and worrying thing was that I was still losing weight each day, though. I continued to have some pain, although it was better than it had been, and nausea and vomiting continued to be a major issue. I had to have new NG tubes passed down every few days, due to vomiting them up. I got to the point where I was able to get out of the hospital for a few hours some days; I managed to go to the shops, cinema and to the hair dressers to get my hair dyed pink! One of the gastric consultants suggested that I could start eating a few of my favourite sweets again, which I tried over the course of a couple of days. But then, my pain and nausea started getting worse again. The anaesthetists and pain team had to become more and more involved. 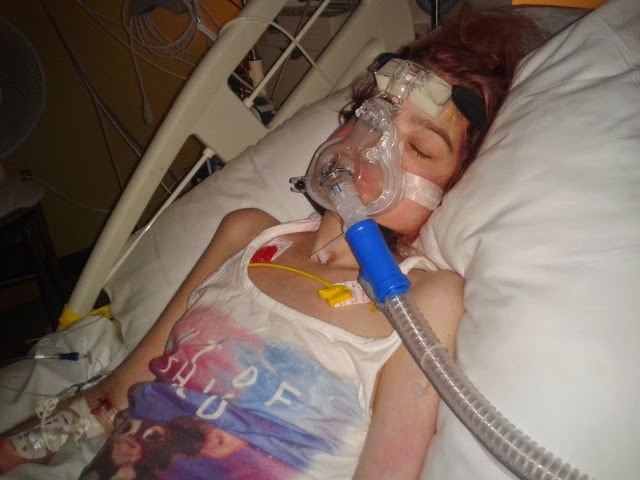 One night, I was put on a morphine pump - it took until after 4 am for me to be able to sleep! The pain team prescribed a new anti-sickness drug which wiped me out completely. For pain relief, they added in buprenorphine patches and fentanyl lozenges. The pain, nausea, albumin levels and weight continued to get worse for weeks, but my chest remained in a relatively good condition compared to how it had been during the previous year. I was in more and more pain everyday, and the nausea and vomiting got worse and worse until eventually it was continual throughout the whole day. On Saturday August 16th, I suddenly started finding it really difficult to breathe, and was put on a Vapotherm machine to help. My albumin level had dropped to 13, and I was retaining lots of fluid, so they decided to give me an albumin infusion. After this my breathing got worse and the following day my nausea and vomiting, which it seemed couldn't get any worse, some how did get worse. I was exhausted, and my vapotherm settings were being pushed up and up in an attempt to support my breathing. I started feeling worse every time I had something pushed through my PICC line, and it was suspected that I had a line infection. In the early hours of Monday August 18th, my oxygen saturation kept dipping, despite my vapotherm settings progressively being pushed up. The intensive care team came up to the ward and checked my blood gases. My carbon dioxide was over 11. I was given a number of bronchodilators in nebuliser form, which brought the CO2 level down a bit, but not enough. I was rushed down to intensive care with respiratory failure, where they put me on a bipap machine to help me ventilate, and they took my PICC line out in case it was infected. I can't even remember being taken to intensive care. and don't remember anything about my first couple of days there. When I did start to become more aware, I started asking how I ended up there. I was confused because my chest had been in a better state than it had been for a long time, and there were none of the usual clinical signs of infection. It all seemed so sudden, too. Being in intensive was really hard again. It is so different from the ward in many ways, the environment and atmosphere is very different. They don't provide anywhere for someone to stop with you, either, but my dad stopped next to me for the whole two weeks, just sleeping on chairs next to my bed. 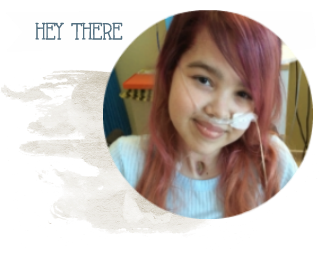 My chest continued to be very clear throughout my time in PICU, and for some reason, from the day I was rushed there, the symptoms of my gut issues were greatly improved. After two weeks in intensive care on bipap, I had been getting some pain in the right side of my neck for a few days, when my physio noticed that there seemed to be something that might be air in my neck. I had an x-ray, and it was confirmed that the bipap had caused air to build up and collect in my neck. I was put on Optiflow, and then Vapotherm, at a 100% oxygen concentration, to help disperse the air. The following day, because vapotherm can be used on the ward, I was allowed out of intensive care and back up onto the adolescent ward. It was the 2nd of September. It's not exactly home, but it's so much better than being in ITU. On the day that I came out of intesive care, my CRPs were 9, but two days later they were way up, at 160. And so started a roller coaster of bad days and better days, and lots of antibiotic changes. One new antibiotic, which I'd never been on before (Fosfomycin), made me feel really ill, and had to be stopped after two days. My vapotherm settings have been weaned down, and have then been put back up again a number of times. After my intesive care stay, because I lost even more weight and muscle, and was stuck in a lying position in bed for two weeks, I was left unable to walk, or even take my own weight enough to allow me to stand. My gut issues have cotinued to improve slowly, and about a month ago, I was told to start trying some easily digestible foods orally. I first started trying the type of crisps that melt in your mouth, Quavers, Skips, and Monster Munch (Pickled Onion flavour, of course). Then I started trying some simple, low fibre cereals like Frosties and Sugar Puffs. As the weeks have gone by I have been able to eat more and more varied foods on top of my 2,500 mls of NG feed. The day after I stopped one of my antibiotics, Tigecycline, my nausea improved massively and I ate 4 meals, plus snacks. It's still been tough. because, as my digestive system is getting used to eating more solid and varied foods again, I have had lots oif discomfort, but I am working through it all as best I can. It is working, because I have suddenly started putting a good amount of weight on. I was weighed on the 13th of October, and was found to have put on 2.5kg (5.5lbs) in 10 days, and then on the 18th I had put on another 600g (so thats's nearly half a stone in two weeks). My albumin level which has been really up and down, but very low for months, is now at 22, which is the highest it's been since being admitted to hospital nearly four and a half months ago. I am so pleased, and just want it to keep going up with my weight, and getting stronger. The doctors here have been in contact with Newcastle hospital about the possibility of transplant. At the moment, my weight and albumin level is a problem, and I can't be listed at this point in time. It upsets me that transplant isn't an option, should I need one. However, I am now gaining weight, and my albumin levels are rising! I try to keep myself occupied in hospital, but it can get very boring sometimes! I like talking to people on Facebook - I have made lots of lovely friends with CF on there - and I also like reading, drawing, watching films and chatting to my family. I've been sent lots of sweets from America from some of my new CF friends (yum!). A few weeks back, we had a week organised by Readwell, a charity which gives books to children in hospital to keep them occupied, where some authors came to visit the ward. I met Henry Winkler (the Fonz) and Alex T. Smith (author of the Claude series). I also got free signed books from them and from David Almond, the author of Skellig. It was a fun week, and I found it fun talking to the authors as I would like to be a writer myself! I would really like to be able to get well enough to get out to the ward for short periods of time. I would love to get to the shops and the museum/art gallery! I'm having a wish granted by Rays of Sunshine - a shopping spree! So I want to get well enough to do that. In the last few days, I've been having abdominal pain and felt a little more nauseous. I hope this is just a short term thing, that will go away soon. The doctors are not too concerned, though, so that's reassuring. Ooh! I almost forgot to tell you this! My family and I have a new house - in the Lake District! I'm so excited to move there. I will miss Devon a bit, but I'm looking forward to a new start in the new house! This means that I will also be under the care of a different hospital - the Royal Manchester Children's Hospital. A date hasn't yet been set for my transfer to the new hospital, but hopefully it will be soon. Thank you for reading! I hope you're all well :-)! I will try very hard to update more often! You can follow me through my Facebook page and friend request me if you'd like! I love talking to new people, so just message me if you want! I hope you like the new look of my blog too! I had a visit from Louis the chihuahua! Aww, my cute little Daddy ;-)! I think he was tired! My lovely birthday cakes - I didn't get to eat any! My swollen hand, after a cannula went wrong! I wasn't allowed milk when I tried this - so I had to pour my feed over Sugar Puffs! It was surprisingly nice!